Home » Aqua Master Online » The Animals Were at it Again! The 15th annual Canby Animal Meet, held on January 13, 2019, saw 50-plus swimmers come out to compete for the right to call themselves “Animal Champions”! This meet is a lot of fun, and is definitely unique. Regardless of age group, swimmers channel their inner animal into one of three categories: Sprint Animal, Middle Animal or Grand Animal. Each category requires three events to be swum: an IM event, a butterfly event and a distance freestyle event. Placing is determined by the cumulative time of all three events. The Sprint Animals go for it in the 100 IM, 50 fly and 200 free. Middle Animals take a swing at the 200 IM, 100 fly and 500 free. The Grand Animals try to survive the 400 IM, 200 fly and 1000 free. 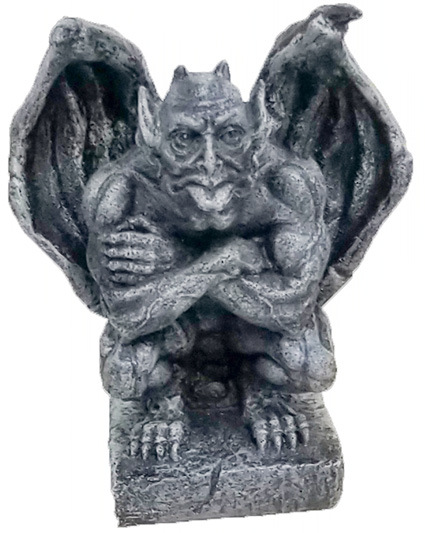 Some swimmers do pick and choose their favorite events only, but in order to be eligible for the coveted Gargoyle trophies, the Animal category combo must be completed. OK, let’s move on to the results! Starting with the women, Julie Kamat earned the title of Sprint Animal. Sara Shepherd laid claim to the tightly contested Middle Animal title, setting a new Oregon Record in the 200 IM for women 35-39 (2:16.89) along the way. 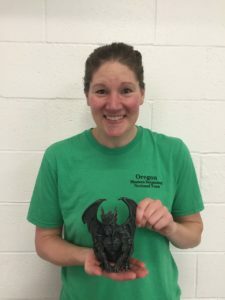 Tessa Reeves won her second Gargoyle trophy in the Grand Animal category. 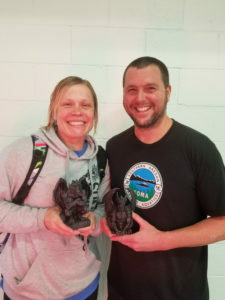 Great swimming, ladies! Congratulations to you animals. 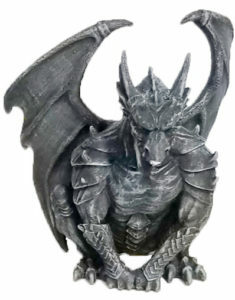 In the men’s results, Adam Arzner handily took home the gargoyle trophy in the Sprint Animal category. Well done, Adam! 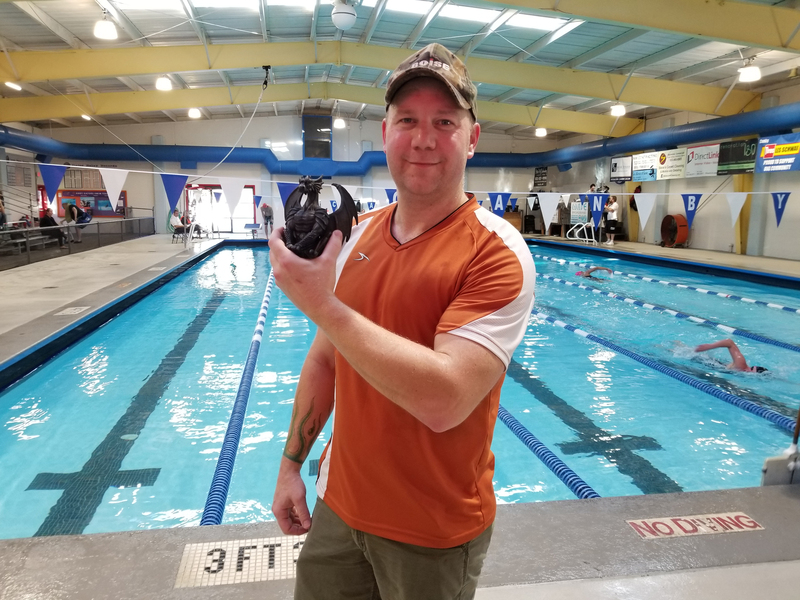 In the Middle Animal category, James Adams took care of business and earned the Middle Animal title. In the men’s Grand Animal category, Matt Miller and Grant Aldred had a good race. Grant dominated the 200 fly while swimming next to Tom Phipps who set a new OMS record (2:58.24)! 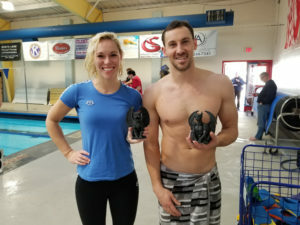 Matt was able to pull out wins in the 400 IM and 1000 free, enabling him to take home the Grand Animal Champion title. Overall it was a fun and well-run meet that seemed to be enjoyed by all who attended! Thanks for hosting, Canby! !